The hot chocolate festival is back again this year for the 7th time with 29 participants and 61 flavours to try! I had a craving for Lucky’s Doughnuts and Forty Ninth Parallel Cafe is also participating in the hot chocolate festival so it was the best of both worlds. Their hot chocolate is also reasonably priced as well. The festival runs from Jan. 19 to Feb. 14, 2017. This entry was posted in Cafe/Bakery, Food Reviews and tagged desserts, donuts, doughnuts, hot chocolate festival, Lucky's Doughnuts. The Hot Chocolate Festival is on again for the sixth year and after perusing some hot chocolate menus, the Black Magic from Bella Gelateria caught my eye. It’s made with Dark 63% Vanuari chocolate with black sesame paste and matcha whipped cream. The Asian inspired flavours certainly sounded interesting in hot chocolate form! This entry was posted in Cafe/Bakery, Desserts and tagged banana bread, black sesame, hot chocolate, hot chocolate festival, matcha. For my next hot chocolate festival destination, I went to French Made Baking. They seem to have expanded their seating since my last visit and they also have crepes and a few lunch options. For the hot chocolates festival, they have five different flavours and four are available on specific days and the “Lord of Hot Chocolate” flavour (Earl Grey infused milk chocolate) is available everyday. I picked the Smokin’ Hot Chocolate which was available the day I went. This flavour had smoked carmelia milk chocolate with sea salt and contains coconut milk. The portion was an 8oz cup so it’s small and also the server put the lid on it already so I didn’t bother opening it to take a picture. The cup itself was also just a plain white cup with no logo or anything… I guess they don’t really serve drinks as much as desserts. The hot chocolate itself had subtle salty flavour that was thoroughly mixed with the milk chocolate. What I mean is that it wasn’t like “BAM wow that was salty!” and then it goes away. It was sort of salty throughout but not overly so? I think I liked the hot chocolate from Terra Bread’s more since I enjoyed the prominent spiced orange flavour over the sea salt flavour. Also, the cup was a lot bigger and it came with a cookie too for about the same price. The Smokin’ Hot Chocolate was not as sweet though due to the sea salt but it could’ve been more chocolatey. It seems like it was suppose to be served with a Caramel Mou (soft salted caramel bonbon) but I think that costs extra. Still on the hunt for my fave hot chocolate! Any recommendations? 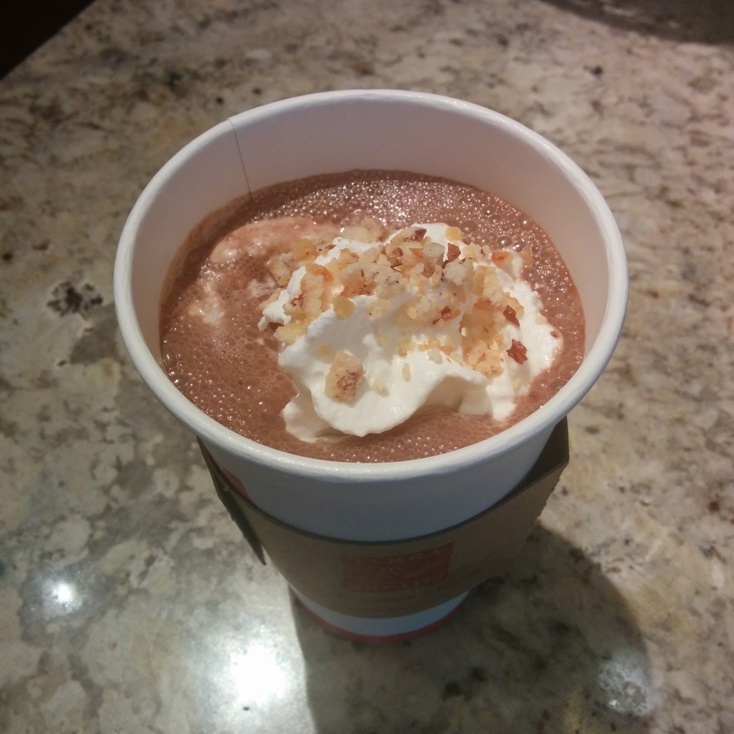 This entry was posted in Cafe/Bakery, Desserts, Food Reviews and tagged hot chocolate, hot chocolate festival. The Hot Chocolate Festival has been on for a few years now but I’ve never actually tried anything despite being a fan of hot chocolate or anything chocolate really. This year I decided to try Terra Bread’s hot chocolate since I work near them. Actually I work near both of their locations, the one in Olympic village and the one on 5th and Ontario St. They have two hot chocolates to choose from: Stollen Kisses or Balsamic Desiderio. This was the Stollen Kisses Hot Chocolate prepared with Cacao Barry Extra Brute cocoa powder, spiced orange and almond syrup. The whipped cream is sprinkled with crumbled macaroon. Right away I could smell the spiced orange flavour! The hot chocolate was rich in chocolate flavour and you could really taste the spiced orange and almond flavours. I found the drink to be a little too sweet though (even for me!). On the other hand it was a bit weird to be drinking chunks of the coconut and almond macaroon mixed with the hot chocolate but it gives you something to chew on. I just thought of it as like chewing on pearls in bubble tea. Also I’m not sure why my cup wasn’t filled all the way up? The hot chocolate is also suppose to be served with a stollen kisses macaroon but sadly they ran out for the day. However, they did give me the Maldon Salt Truffle Cookie which was served with the Balsamic Desiderio Hot Chocolate. 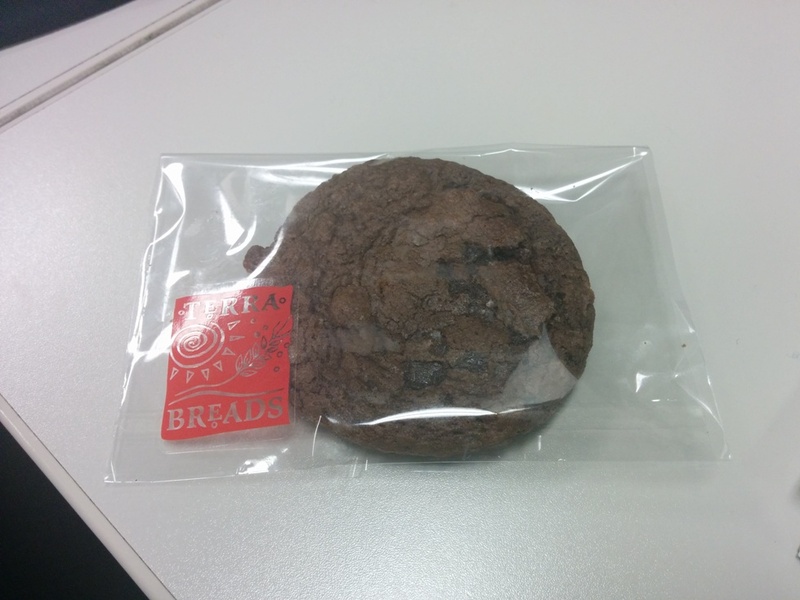 The truffle cookie had melted chocolate in the centre and was amazingly chocolatey. There were also hints of saltiness to offset the sweetness of the soft chewy cookie. I gobbled this up really fast! The hot chocolate festival ends Feb. 14th this year. This entry was posted in Cafe/Bakery, Desserts, Food Reviews and tagged chocolate, cookies, hot chocolate, hot chocolate festival.